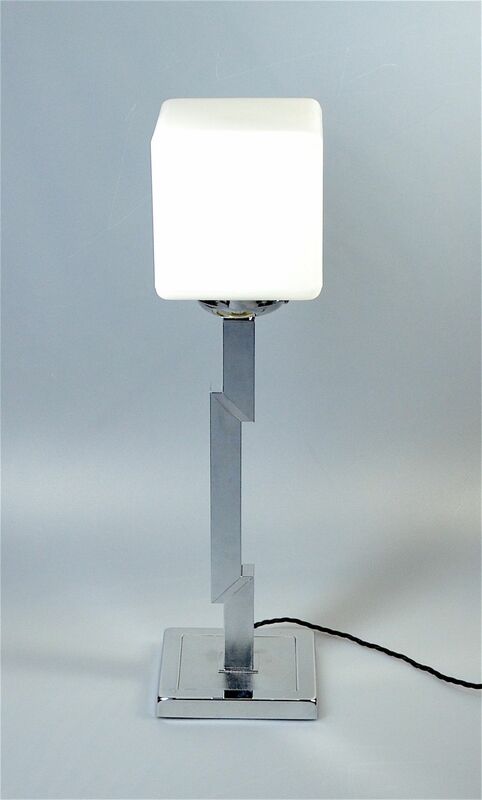 This very unusual & distinctive lamp has a polished and brushed chrome finish. Probably French it has a square base the outer edges of which are in polished chrome and the inner square in brushed chrome. The central column has a brushed chrome finish with two polished chrome "stripes" that emphasise the two dogleg sections. The column supports a chrome gallery on which sits the square opaque white glass shade that is held in place by the usual chrome screws. The base is weighted with an iron insert to give good stability.